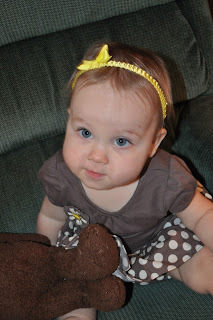 Chloe, it's February 28, 2011 and you are nine months old today! You are still napping pretty good and sleeping 12 hours a night. You were recently sick. We made your first trip to the doctor last Monday. You had a virus which caused a LOT of drainage. You were pretty miserable and running a pretty high fever. Since your illness, you've decided that you want to be rocked to sleep for your naps. I enjoy it but I'm afraid it will develop into a "I only sleep when you rock me" attitude. You are feeding yourself now. You started refusing purees this past week. That threw me for a loop and I had to get creative with your foods. You now eat small pieces of whatever we are having. In the morning, you have egg yolk, toast and fruit. For lunch, you usually eat turkey, carrots and a slice of wheat bread. At dinner, you will eat pieces of whatever your dad and I are having or the leftovers from the night before because I usually don't have dinner ready by 5:30 which is when you want to eat dinner. You are only having 3 bottles a day now: 8 oz around 10, 8 oz around 3 and 8 oz before bed. You have 8 teeth now (4 top and 4 bottom)! You are now crawling everywhere. You know how to crawl up the stairs, but you're so clumsy that it's NOT ALLOWED. You attempt to climb onto the couch. You are pulling up now and standing all the time. You love to stand in your crib and yell at me. I've caught you trying to stand without holding onto stuff. I'm sure by the end of the month you will be. You also think it's fun to climb over things (like me when I lay on the floor). You are starting to show a lot of interest in your books. You get very upset when you want us to read to you and we're not. You will sometimes open your books and read to yourself...that's so cute. I love hearing your little voice and made up words while you explain the page to yourself. Chloe you look like a doll all dressed up for a special play day. Wish I could hear you read your books. Sorry you were ill but glad you are better. Kim, she is adorable. I just wish you could record her as she enjoys reading her books. Have a great day with your sweet baby. Can't believe she's 9 months old already! 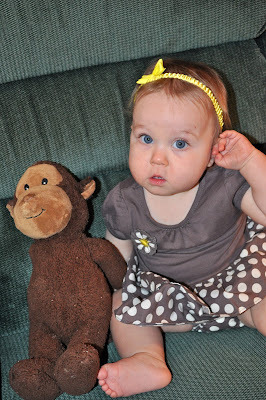 I love her reading to her monkey!